What is your favorite MOM-MADE dish? Hey all, welcome back to this blog space. Hope you all are doing super fine. 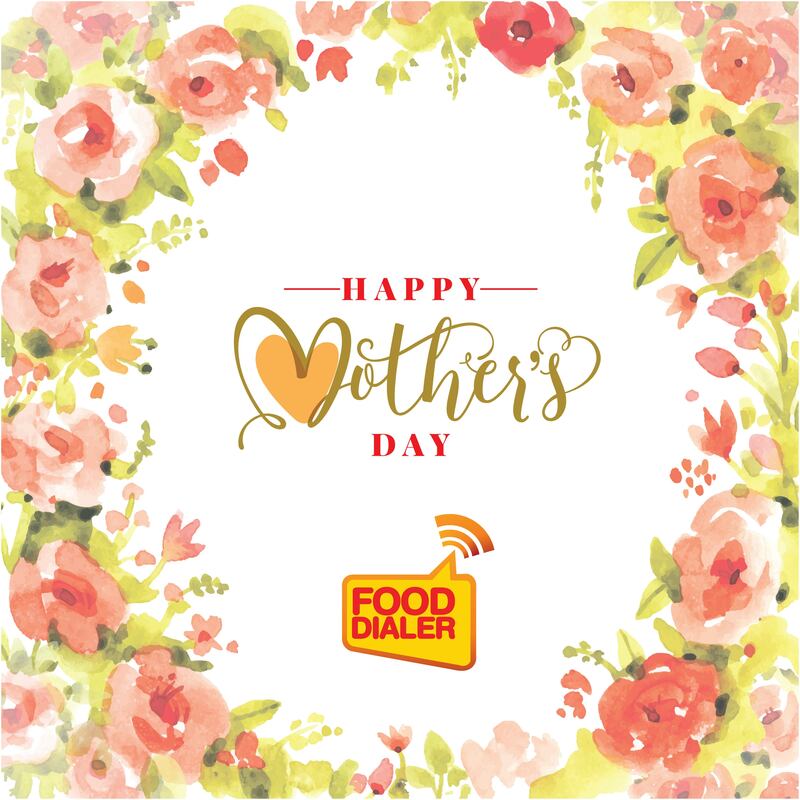 So fresh out of Mother’s Day celebration yesterday, I thought of doing a Mom’s special dish compilation here at Fooddialer, and you are gonna help me out. Yes, you heard that perfectly right. Today, I am looking forward to you sharing that one mom-made dish of yours that you love the most. Now I know, mom-made dishes are mostly despised when we get to eat it everyday i.e. when we are young and under mom’s care. But as soon we grow up and leave home and city for higher studies and job, we realize how good our moms cook. And then onward, what we look forward is called vacation and prior to one such we do not forget (at any cost) to list out to mom, the dishes she should cook once we are home. Today I want to know from you, the name and recipe (in short) of that one dish that mostly appears at the beginning of that list. Therefore, please share with me the dish and its short recipe in the comment section below! When I am asking you to share yours, it’s my duty to share mine as well. And honestly, I would love to do so. Since, I get to visit home only once in one or two years, my list is generally a little lengthy. But the name that almost always appears first is “Prawn-bhindi curry”. Now we being bongs, something will definitely be related to fish and prawn, and that’s for sure. Prawn-bhindi curry is a bong dish and it’s really a very simple to make and is finger-lickingly good. I tried making it few times myself at my home and they turned out pretty good. But, but, but, the mom-magic is always missing. So let’s begin with the recipe. 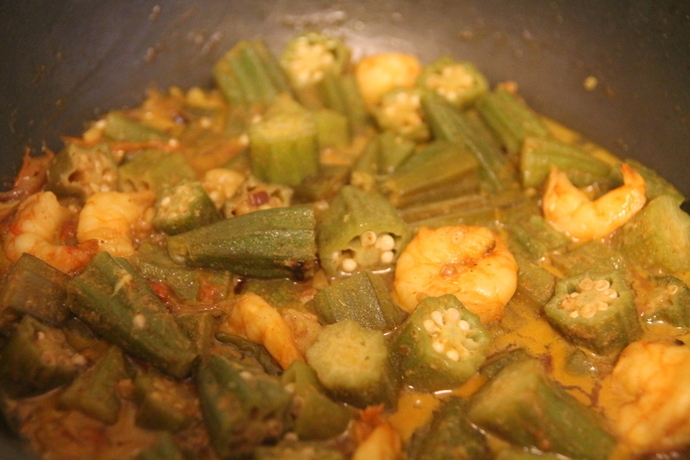 All you need is : Bhindi/Okra (Lady’s Finger)- 500gm (beheaded & cut into 1-inch pieces), Prawn- 250gm (deveined and washed, retaining the head is optional), Onion- 2 (small, thinly sliced), Tomato- 1(cubed), Chilli Powder- 2 tsp, Turmeric- 1/2 tsp, Coriander powder- 1 tsp and Cumin Powder- 1 tsp, Oil- 2 tbsp, Sugar- 1/2 tsp. Salt- As per taste. Now, lets get into cooking. Marinate the prawns in salt and turmeric for 10 min and then lightly shallow fry in oil. We use mustard oil for it, but if you are not used to its heat, you can use any other refined oil. Done with the prawns, in same oil add thinly sliced onion, give a stir and add okra. Mix and cover. Check once in 2 min and cook till the okra are half done. Cook in medium flame and spinkle water if necessary. Now add tomatoes, salt, sugar and turmeric powder. Again cover and cook till the tomatoes are mushy. Then add the light fried prawns, chilli, coriander and cumin powders. Mix and add half a cup of water. Cook till okra is fully done and some seeds are out into the gravy. There you go. Serve it will thinly made Masoor-dal and steaming rice. Hope you will love the recipe. Do give it a try and let me know how it go with you in the comment section. Till then, eat healthy and stay happy. And do not forget to share your recipe with us.